Problem: Cats stalk, leap, grab, chase, run, and ambush in the name of fun and catching mice. If your bare toes are wiggling on the carpet, your cat might mistake them for something tasty and stalk your toes until he pounces and bites.This behavior is cute when it’s kitten on kitten, but not when your cat chomps down on your toe. Solution: Play with fishing pole type toys to keep those teeth away from your skin.Don’t let your fingers dangle over a cat when you play with him — he might mistake them for toys. Solution: If you see any of those signs, stop petting the cat. If you’re holding him, put him on the floor. Problem: Some cats protect their territory. Usually this type of aggression is shown toward other cats but it can be directed toward people or other household animals. A cat marks his territory by patrolling an area, then chin rubbing or spraying urine to mark a particular place. The cat ambushes or chases an intruder away from his area while displaying offensive postures such as hissing or swatting. The cat’s territory could be the entire house, a room, or even the litter box. Solution: Use a process of conditioning to help the cat get along with whoever triggered this reaction in the first place. Problem: This type of aggression is dangerous because the cat is out of control. It occurs when a cat is aroused by a cat, another animal, or a person he can’t reach. A cat walking outside past the window may upset a cat and make him want to defend his territory. He can’t reach the trigger of his anger due to the window. Instead he lashes out at whoever is closest, whether that’s another household animal or a person. Solution: To keep from being bitten, do not approach an agitated cat. Walk away and let the cat calm down. 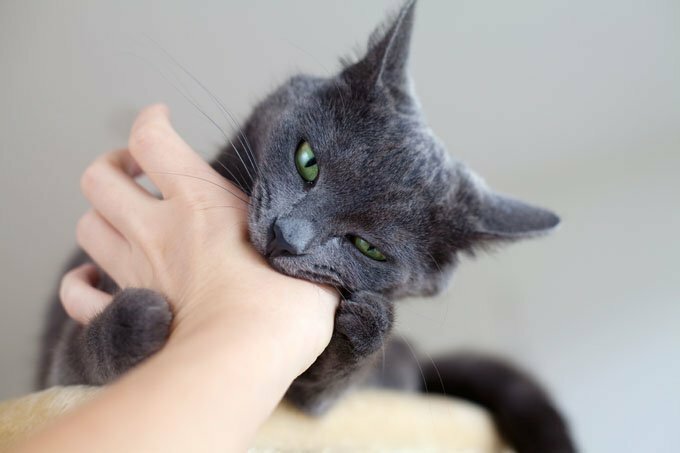 It is important to check with your veterinarian if your cat suddenly begins biting or showing aggressive behavior. If there is no medical cause for the biting behavior, you might be referred to an animal behaviorist for help. Finding the cause of biting aggression and treating it promptly is important.